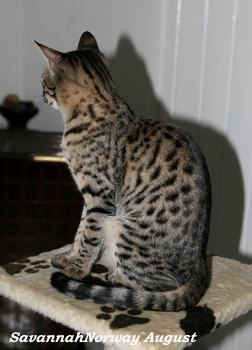 Is a TICA registered cattery, SavannahNorway is Frank Steinsland and Camilla Hesby Johnsen. F5 is the first legal generation of Savannahs in Norway and we will therefore concentrate only on breeding late generations Savannah cats. We will particularly focus on breeding typey cats in later generations and mainly C or SBT registered cats that you are able to show in TICA shows. Sweet temper is something we also put very high. We live on an old farm called Syverud located in a peaceful area in the countryside in the county Vestfold. The farm has been in our family for several generations and has a lovely view of the Oslofjord. We are located about 1 hour from Norway’s capital Oslo and 1,5 hours from Gardemoen international airport.